Now that the Hubway bike-sharing program is here, some Bostonians seem to believe an alien is landing, and that utter chaos — or at least massive inconvenience and injury — will ensue when kiosks open Tuesday. Nothing could be farther from the truth. Providing locals and visitors the ability to grab a bike to get from point A to point B will promote physical activity and cut pollution. But most of all, bike-sharing promises to fundamentally change the driving culture in a city known for cavalier motoring — and spark a renewed appreciation of the urban environment itself. Those transformations would be good for everyone in Boston, not just the bikers. Our streets are shared space, a concept championed in the movement for complete streets. An injection of Hubway bikes will change expectations and raise awareness in the minds of motorists that they are sharing the road with others. The increased bike-riding activity has the potential to bring about this kind of attentiveness more powerfully than all the bright yellow warning signs and painted bike lanes that have been established in recent years. Yes, many of the people riding these bikes might be classified as innocents. Some may ply the streets gingerly or even haltingly at first, testing driversâ€™ patience. Iâ€™ve just returned from London, where brave tourists use the bike-sharing program. One might think it would be a total disaster remembering to ride on the left and navigating the sometimes quirky street layouts; not for nothing do the British call some junctions a circus. But something interesting happens instead. Riders rise to the occasion. They stop consulting their maps every block, get with the flow, and maybe even allow themselves to get a bit lost. They end up appreciating the urbanism of the city at a scale that almost guarantees discovery. Behind the wheel, the most jaded drivers may scoff (or mutter into their fish sandwich). But others might pause and think how theyâ€™ve always wanted to explore that cobblestoned lane. As it is in many other ways, Boston is late to the game in bike-sharing. The idea had its origins in Europe. In the U.S., cities like Washington were early adopters. The program works particularly well in one of the earliest experiments, in Paris, where both the aggressive driving habits and maze-like streets are Bostonesque. The bicycling culture in London is also robust, particularly since the city instituted congestion pricing — charging $16 to drive a private car into the downtown core. The practice is in place in Stockholm and Singapore, and Mayor Michael Bloomberg has tried to institute a similar charge below 86th Street in Manhattan. It may or may not make sense for Boston, but the policy takes a city by the lapels, and reminds everyone of the many other options for mobility — trolleys, buses, pedicabs, biking, and walking. Any such expansion of possibilities ends up being good for quality of life. So let the pedestrian cross in the unsignaled crosswalk, look in your rear view mirror before you open the car door, and go ahead and let yourself celebrate all those slightly clunk-looking silver and black bikes that will soon be unloosed on the metropolis, like a flock of doves. Anthony Flint is a fellow at the Lincoln Institute of Land Policy, a think tank in Cambridge. Follow him on Twitter at @landpolicy and @anthonyflint. 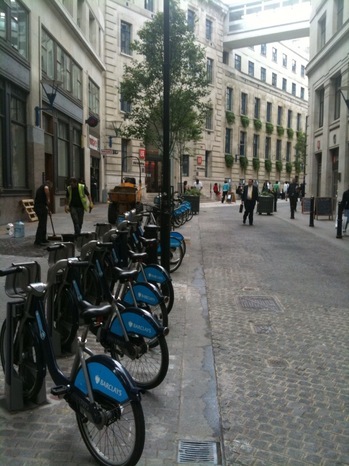 Photo courtesy Anthony Flint:Â a bike-sharing stand near the London School of Economics,Â one of about 140 in the city. ABOUT THE ANGLE Online commentary and news analysis from the Boston Globe. The Angle is produced by Rob Anderson and Alan Wirzbicki. You can follow Rob on Twitter at @rcand. Tickets for T seat hogs? Why the MBTA should punish riders who needlessly claim more than one seat. Why Invisible Children films are the new textbook of civic engagement.